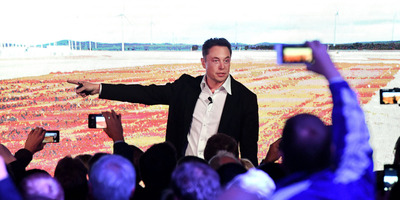 Mark Brake/Getty ImagesElon Musk during his presentation at the Tesla Powerpack Launch Event at Hornsdale Wind Farm on September 29, 2017 in Adelaide, Australia. Tesla laid out an unprecedented plan to go private at $US420 per share on Wednesday, sending Wall Street into a flurry. Elon Musk on Tuesday sent shockwaves through Wall Street when he cryptically tweeted that he was considering taking Tesla private at $US420 per share. 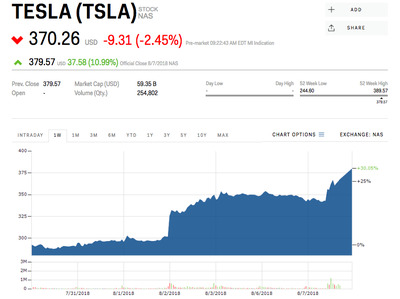 The announcement, followed up with only slightly more detail in an email to employees published on Tesla’s website, sent the company’s stock price soaring more than 10% – and burned short sellers in the process. As for the plausibility of such an unprecedented move, Wall Street analysts appear to have mixed feelings. 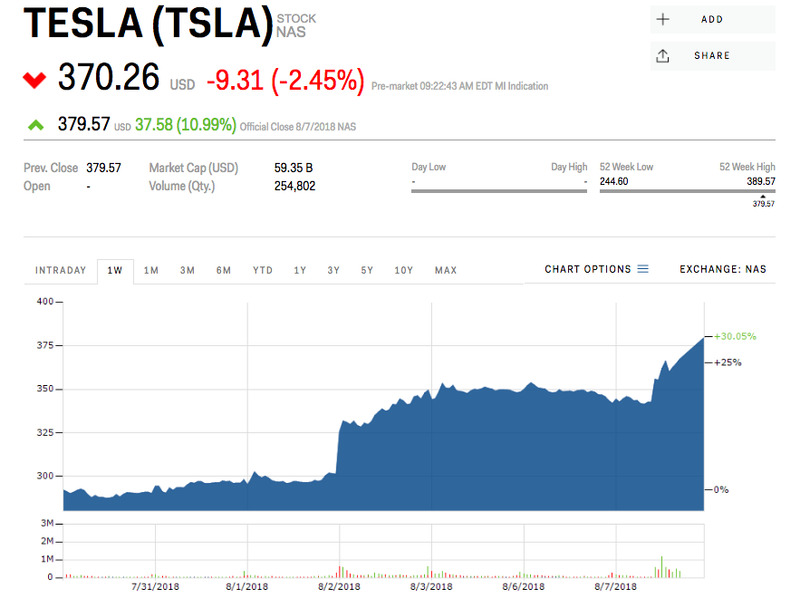 While they generally acknowledge the strain on the company that being public – and the quarterly reports, disclosures, and intense scrutiny that come along with it -have worked against Tesla in the past, they also recognise that Tesla needs access to capital that public markets can provide, and question the valuation Musk touted Tuesday. “Traditionally, public markets have been there to provide a source of funding (note, we also believe they bring scrutiny and accountability which in many cases does lead to better practice),” said analyst George Galliers. “Taking a traditional LBO [leveraged buyout] approach of 6.0x leverage, in-line with historical LBO’s according to our GS credit research colleagues, this would imply $US21 billion of debt financing on our 2020E EBITDA (and $US29 billion on consensus) – leaving a need for incremental equity financing in the amounts of $US47 billion (and $US40 billion on consensus estimates); this would lead to lower interest expense -but still likely not positive cash flow generation (when capex is considered: 2020 GSe of $US3.5 billion and consensus of $US3.6 billion),” said analyst Heath Terry. “His method of using Twitter was very atypical for historic go private offers,” said analyst Jeffrey Osborne. “The ability to convince shareholders to stay involved is likely critical to the success of Tesla going private which would be the biggest buyout in history (over $US70 billion),” said analyst Joseph Spak. “Because of traditional buyout funding challenges, we believe this indicates there is significant outside funding that is interested,” he continued. “Post announcement, shares closed at ~$US380, with the take-out price implying ~10.7% upside from here,” said analyst Colin Langan.